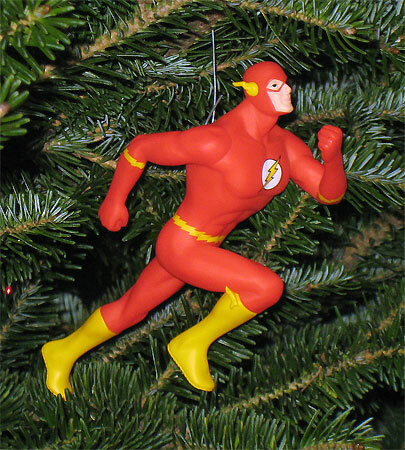 Just thought I would share some of the geeky Christmas ornaments that adorn our tree. 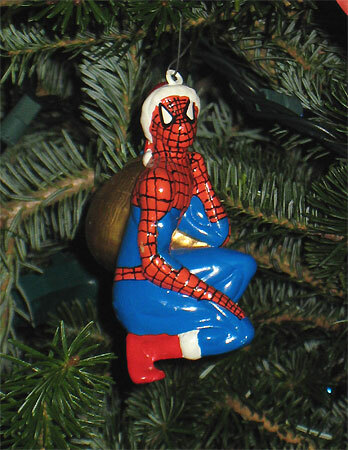 I love the Spider-Man ornament below. It’s got great detailing and the webs in each hand are cool! Below is a cute Santa-Spidey! 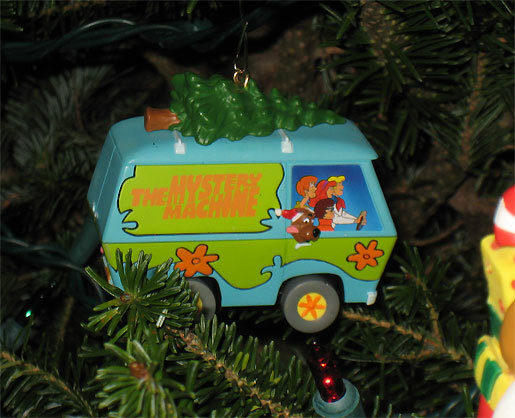 You can find a nice Scooby-Doo Mystery Machine below, complete with rolling wheels, Christmas tree on top, and Scooby in bas-relief. 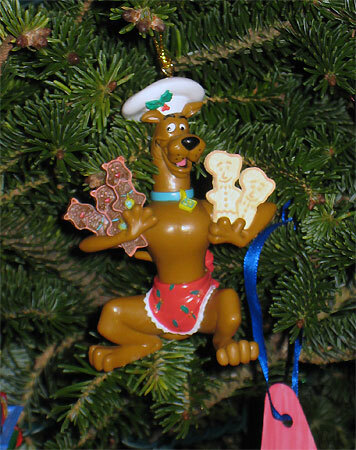 Scooby baking Christmas cookies in the shape of himself and Shaggy! 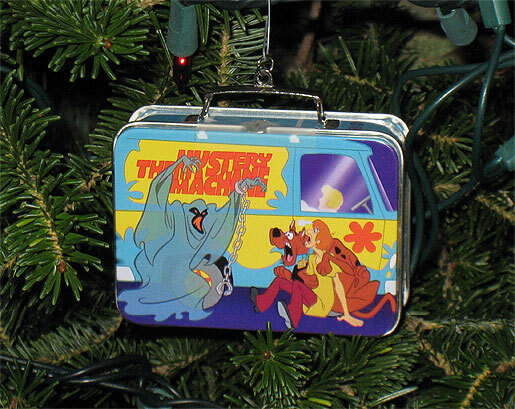 Below is a miniaturized replica of a Scooby-Doo metal lunchbox. Unfortunately, my three year old daughter has pilfered the thermos that went with it. Below is an interesting Batman and Robin pairing. Robin is clearly the Tim Drake Robin, but Batman isn’t wearing blue trunks. That suggests this is the Batman from shortly after the Troika storyline in 1995. … Wow, it’s scary I know things like that. Here is a genuine E.T. 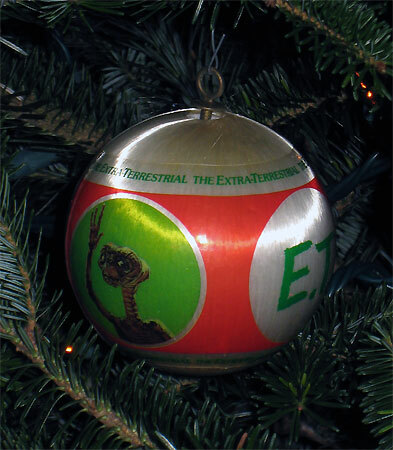 The Extra-Terrestrial ornament from 1982. Somehow I’ve managed to hang on to it all this time. 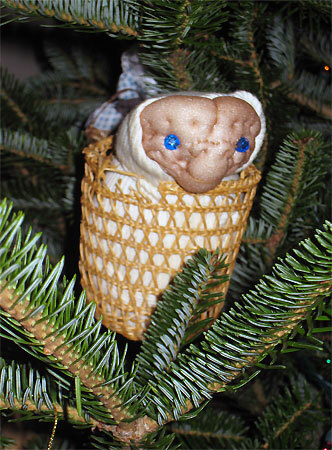 Here is another E.T. 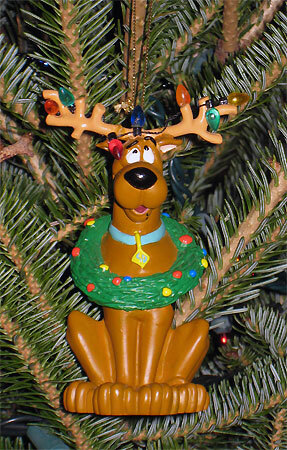 ornament from 1982 I’ve somehow managed not to lose. This one is handmade. I believe my mother bought it at a craft show in 1982. Below is another miniaturized replica metal lunchbox. This time it’s from the Super Friends, including images of Flash, Batgirl, Green Arrow, Superman, Wonder Woman, Batman, Robin, Hawkman, and Green Lantern. The thermos features Catwoman, the Joker, and the Riddler. 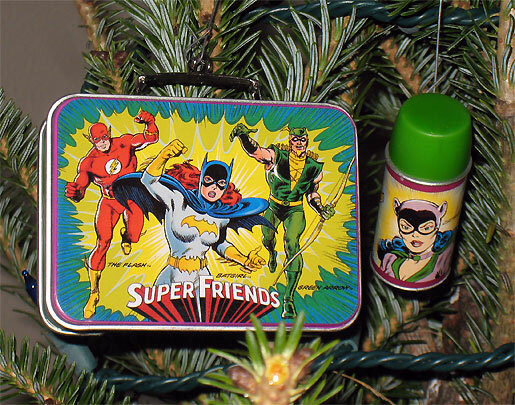 Oddly enough I don’t believe Batgirl or Green Arrow ever appeared on the Super Friends show, and yet they made the lunch box. Weird. Below the likeness of Barry Allen, The Flash, is captured between the seconds as he races to beat 20 years of continuity and come back from the dead. 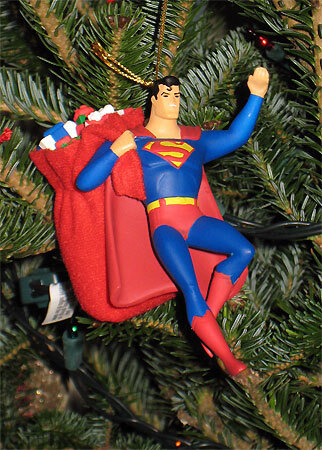 Superman from the Animated Series is delivering Christmas toys in this cool ornament below. Another miniature replica metal lunchbox below. 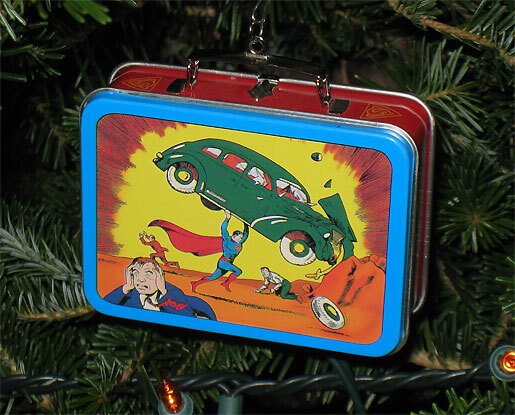 This time it’s a Superman lunchbox paying homage to the cover of Action Comics #1. 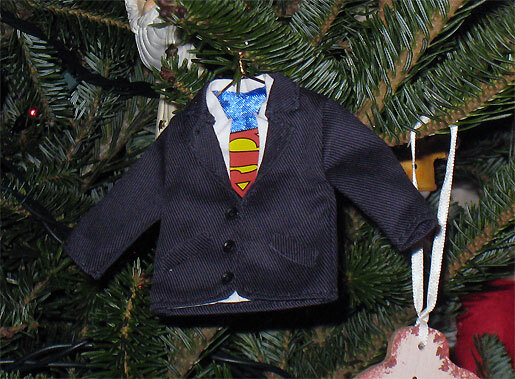 Below is a clever Clark Kent ornament. Notice the detail of the coat hanger and the jacket. Nicely done! 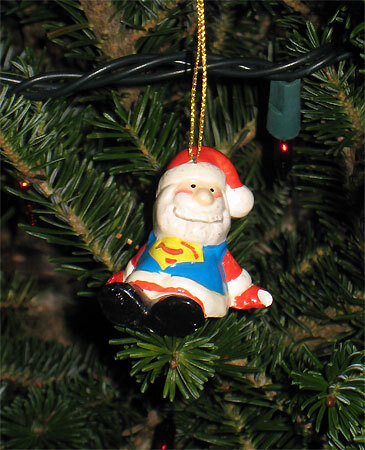 Finally, my favorite geek ornament… Super Santa! Another gift from my mother from my childhood. I like the crossover between Superman and Santa Claus. No Star Wars Ornaments? No Dr Who crap? Call me suprised. The kids really want a Yoda tree topper. I have an Iron Man ornament, a Godzilla one where he is holding the head of Mechagodzilla, a Batman one, 3 miniature ornaments of Max Rebo and the Rebo Band, 5 M&Ms dressed up as evil Star Wars characters, an It’s A Wonderful Life one (a TV which plugs into a light to light up), and a Superbaby (a Superman onsie) to commemorate the birth of our son. Luke – Those all sound awesome! Nice! Love the Scooby Doo Mystery Van – that was my dream car for years! Awesome. I’m with Dan – the Mystery Van is my favorite! Dude, I totally need that Superfriends lunchbox! Also, Green Arrow did appear in one episode of Super-Friends. It wasn’t a terribly memorable episode. 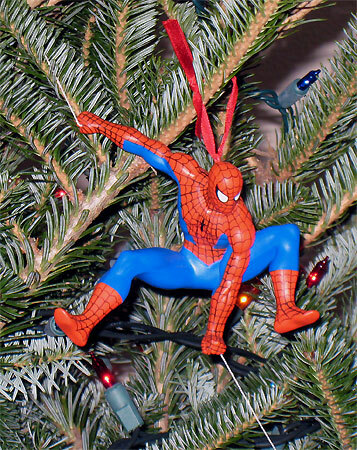 The spidey ornament, the first one I believe with the webs in his hands–any idea where I could get my hands on one of those? It’s for a curio cabinet I’m doing with a bunch of cool stuff like that in it. Im quite a super hero fan myself. Have to say these ornaments are quite funky for Christmas! Not sure if I’ve come across such types in any of the local christmas markets. Where can you buy these online? I’m from the UK and we don’t have anything like this in our shops! Most of these were Hallmark ornaments. I don’t believe they sell them year after year, so you’ll probably have to check eBay. Also check out any new ornaments from Hallmark. 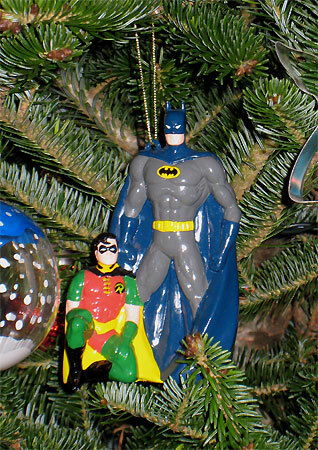 They produce some good superhero and Star Wars ornaments. Thanks for the comments!